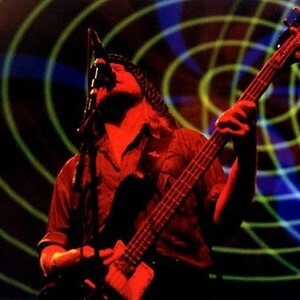 Alan Davey is/was the bass player and second longest serving member of the British rock band Hawkwind. A long-time fan, he joined the group in 1984. During his tenure in the group he has been a prolific songwriter both for Hawkwind and with several side and solo projects such as Bedouin. Davey left Hawkwind in 1996 but appeared with the band again at their 'Yule Ritual' gig in late 2000 and rejoined. Following his non-appearance at Hawkwind's June 2007 Hawkfest plus a posting on Davey's myspace page, it seems Davey has once again parted company with Hawkwind. This has yet to be confirmed by the band. Alan Davey has resurected one of his old bands Gunslinger who have released the album "Earthquake In E Minor"
Louis "Snag" Davey - Rythm and Lead Guitars. "Cat" - Drums, Percussion and backing vocals.